Recently I’ve experienced a lot of frustration with my webhost. In an attempt to move my domain and hosting away from them, I’ve had to deal with their RegistrarPDQ-rebranded domain registration system. RegistrarPDQ is a domain registration system used by many small webhosts. Webhosts and resellers rebrand the RegistrarPDQ site with their own logo and colour scheme, but essentially they’re all the same. Unfortunately, the RegistrarPDQ site layout is unintuitive and many experienced users find it difficult to disable the reg-lock and find the EPP code: the two crucial items you need to transfer a domain to a new registrar! After a few frustrating minutes, I’ve figured out how to do it. The first step is to disable reg-lock. Reg-lock prevents you from moving the domain to another registrar. To disable reg-lock, perform the following. Click You have x domain names with us. Click on the domain name you want to change to another registrar. The second step is to get the EPP code. The EPP code is used to verify the domain owner wants to move the domain to another registrar. To get the EPP code (also known as the Authorization Code or auth code), perform the following. Click on the domain name you want to change to get the code for. Ensure the Registrant Contact details are correct, in particular the e-mail address (the EPP code will be e-mailed to the registrant contact so it must be correct!) If you update your e-mail address, click Save Changes. Scroll to the bottom of the page and click Email Authorization Code to Registrant. To install FIM portal, the setup needs to run under SharePoint Farm administrator account. What is it with Microsoft and unintuitive setup error messages? When attempting to install the FIM Service and Portal component of Microsoft Forefront Identity Manager 2010, I received the following error message. 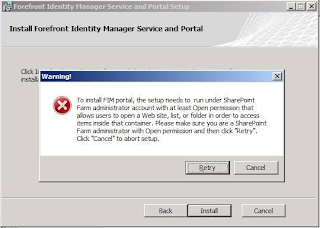 "To install FIM portal, the setup needs to run under SharePoint Farm administrator account with at least Open permission that allows users to open a Web site, list, or folder in order to access items inside that container. Please make sure you are a SharePoint Farm administrator with Open permission then click "Retry". Click "Cancel" to abort setup." The problem? I was not in the SharePoint Site collection administrators group. To add yourself to this group, open Central Administration (Start > Administrative Tools > SharePoint 3.0 Central Administration), click Application Management, then Site collection administrators. Change the Primary Site Collection Administrator to the account used to install FIM.